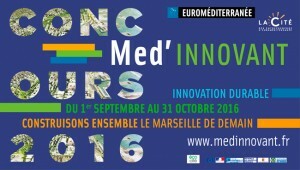 ‘Euroméditerranée’ and ‘La Cité des Entrepreneurs Euroméditerranée’ are organising the Med’Innovant contest until the 31st of October - www.medinnovant.fr. The aim of this big meeting on sustainable innovation in the urban environment, which OCEMO is a partner of, is to select, promote and accelerate project owners who want to lead innovative initiatives in line with the issues of sustainable and urban development in the Mediterranean. This year, c andidates can compete on four different themes: improving st andards of city living; habitat and environment; mobility and security; contactless technology and professional connected objects. “The Med’innovant contest gives us the opportunity to select, promote and support project owners who want to lead innovative and sustainable initiatives linked to the Smart City sector on the scope of nationally relevant operations and more broadly in the metropolitan area. Euromediterranée has given itself a voluntarist strategy for topics such as investments, territorial attractiveness and support for job seekers; sustainable innovation has a key part in it!” highlights François Jalinot, Managing Director of Euroméditerranée. “For the ‘Cité des Entrepreneurs d’Euroméditerranée’ which focuses on the future of the Metropolis and which has the philosophy of welcoming, coordinating, hosting, promoting and giving a network to the structures interested in the Euromediterranean operation, this contest is an excellent opportunity to discover, promote and showcase companies which innovate every day or would be suitable to do so on a Euromediterranean scale” adds S andra Chalinet, President of the ‘Cité des Entrepreneurs d’Euroméditerranée’. The c andidates must submit a presentation dossier for their project before the 31st of October on the Med’innovant website. The ten preselected projects will then be pitched to a committee of independent experts. Prizes will be given to four winners at a networking evening on the 21st of November at the Marseille EMD. Participating in this contest will benefit project owners by putting them in contact with the right people who have the right funds and heads of companies of the ‘Cité des Entrepreneurs d’Euroméditerranée’. They will also gain visibility thanks to their profiles being featured on social networks and the financial media ‘La Tribune’. The selected companies will be lucky enough to test and demonstrate their innovative solution on the Marseille Euromediterranean EcoCité scope. The four winners will share a financial donation of 35 000 Euros and some contributions in kind. “Since winning the prize, we have started business negotiations with major economic stakeholders in the Marseille area. We have managed to exp and into other cities around the Rhone such as Avignon, Valence and Saint-Etienne. Winning the Med’Innovant prize especially enabled us to participate in MedCop21, which is a major showcase for a small structure like ours” says Alex andre Noblet, Director of Lemon Tri, startup winner in 2014.